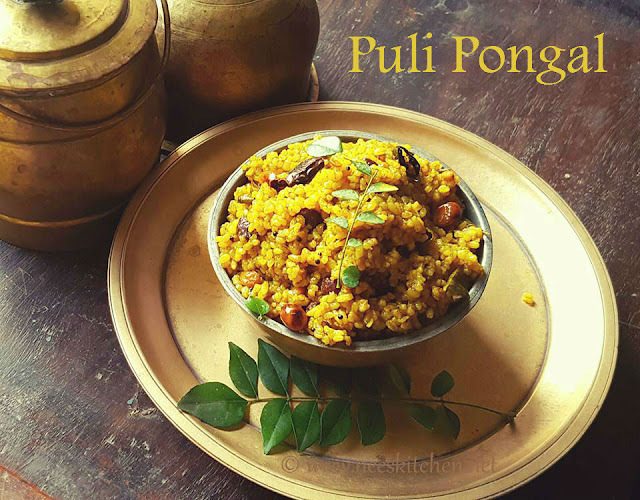 Puli Pongal is a heirloom recipe made with Broken rice and Tamarind as primary ingredient. This post is about quick and easy pressure cooker method of this recipe. Dry Red Chili – 2 nos. 1. To begin making the ‘Puli Pongal’, prepare the tamarind extract by adding 2.5 Cups of water to tamarind (lemon size) and diluting it. 2. Wash 1 Cup of broken rice and keep it ready. 3. Take a pressure cooker and on low to medium flame add 4 tsp’s of sesame oil. 4. Once the oil is hot, add mustard seeds and as they splutter, add hing cake. 5. Add dry red chili and fry until they turn brown. 6. Add toor dhal, urad dhal , black channa dhal and on low to medium flame for 6 -8 minutes. Do not burn the spices. 7. 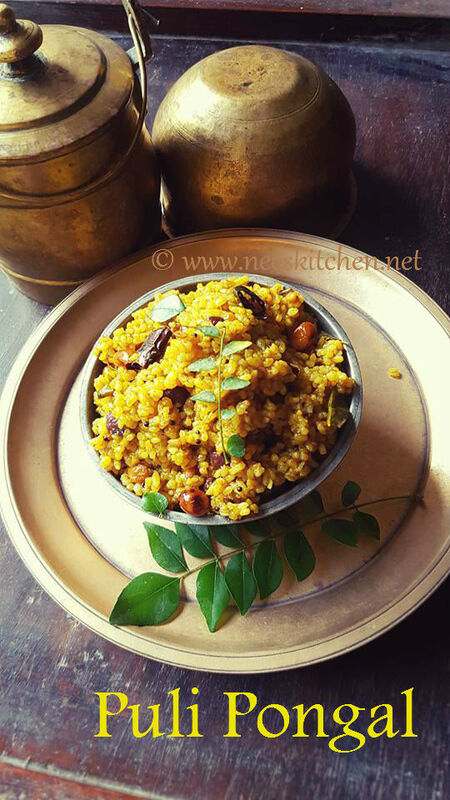 Add roasted peanuts and curry leaves once the spices are cooked. 8. Pour the diluted tamarind water to the spices and add turmeric and salt. 10. Pressure cook upto 3 whistles and turn off heat. Once pressure is off, remove lid, pour a 4 tsp of sesame oil, 1/4 tsp of methi powder and combine carefully. 11. Let it sit for 20 minutes (Ideal 3 – 4hours) for the flavors to set in.